PLEASE NOTE: We have no vacancies at present. You will have a Large Modern Queen bedroom with desk, TV, your own fridge and built in wardrobe. Our home has about 300 square metres of living area. It has 8 bedrooms, 6 bathrooms, 2 kitchens, 2 large living area's and 5 balconies. There is far more space than we need, so we like to share. It sits nicely next to large open fields where you relax, listen to the wildlife, or watch hockey, whilst swaying in one of our hammocks. Our home has two kitchens. One small shared modem IKEA kitchen just for students/guest who might want to cook themselves. It has a stove top, oven, microwave and washing machine. The second kitchen used mainly by our family. We use our kitchen to provide evening meals to our students/guests. We usually provide buffet type meals that you can help yourself to once you have finished a busy day. 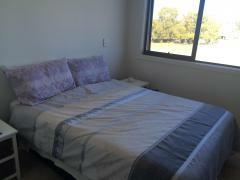 For our guests we have 3 large student/guest bedrooms located towards the front of our house. Two rooms are already occupied by student ballet dancers. 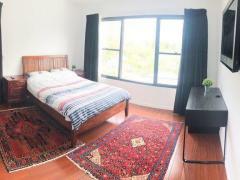 We are looking to rent out the third room to a student/guest. 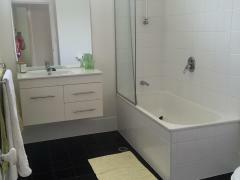 These 3 student rooms share 2 modern bathrooms. Our home has three balconies where you can relax. Our home overlooks Downey park. Downey park is an active park with hockey, netball and jogging tracks. 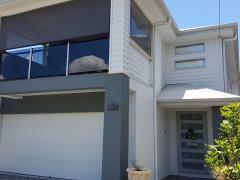 Our home is a very short 5 mins walk to Wilston train station. By train it takes 10 minutes to travel to central station in Brisbane, is which is close to QUT Gardens Point and Botanical Gardens. Our home is just 10mins walk to the RBWH Hospital. At the hospital there is a busway where you can catch bus 66 to the University of Queensland, which is just 25mins. You can also walk directly to Kelvin Grove QUT. It is an easy 20 minute walk. Our neighborhood is very safe. We have Unlimited High Speed Wifi. We will help you when you need and you can spend time with us, or if you want we can leave you in peace and you can have your own privacy. I am an IT Manager at the local hospital, my wife is a physiotherapist at the hospital, we have a 16 year old daughter at school, an 18 year old son at university, a 4 year old daughter at school.